I finished the tag off with some pretty gold swirls and a piece of 70s gold thread ribbon at the bottom. Touch wood, so far so good with my promise to myself to list a couple of items in Etsy shop every day. I am also getting on with sorting out all the many many things I brought back from France after the summer. At the moment they are all jumbled up in boxes and bags, so I am trying to get some order into it all, by categorising. Yikes, good luck to me, lol, its a big undertaking. Still trying to get to grips with the new computer and Windows 8.1. Its a slow process, sigh. Still using the laptop for stuff like this where photos are required, it will take me ages to sort out what to transfer to the new computer and what to get rid off. Have a wonderful week, my dear friends, and thanks for stopping by. 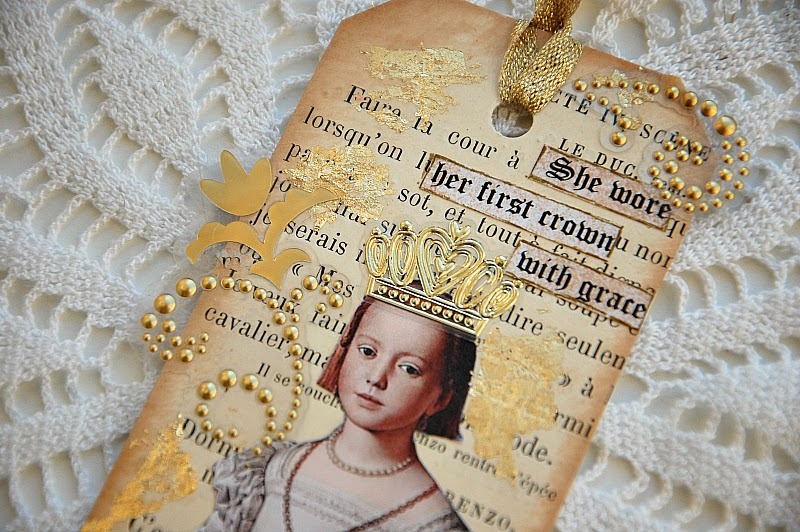 Your tag is gorgeous, dear Liz,- such a beautiful image, and the lots of gold looks so rich and Royal ! Love the swirls and gold-leafe you used- so beautiful . 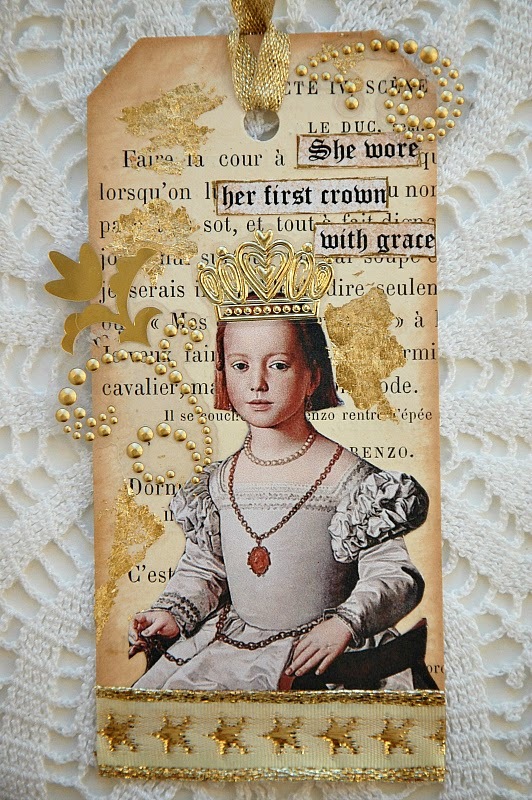 Oh how beautiful is she wearing her first "gold" crown with such a gorgeous dress to match! Your gold touches and words create just the right touch. Hope you are starting to slowly get on top of the 8.1 version Liz. If only Windows would stick to a version that we have grown to use with ease. She is such a sweet princess with a beautiful crown! I have been trying to figure out what to get rid of on my old computer as well. I am afraid the one with the Print Master program on it died last night....Grrrr....I hope I can still get the gazillion images I have scanned onto it off of it! Good luck with yours! Love the sweet little girl with her crown, a real princess, so wonderfully made Liz.